Although I spent part of my childhood on my grandmother’s farm near Cappoquin in West Waterford, I grew up not knowing the names of trees, most flowers and birds. I suppose it is a form of illiteracy, like some people not being able to read music or others not being able to appreciate poetry or learning to speak other languages. In my case, I might even add not being able to drive a car to that list. However, I find I often have warm feelings for particular fields and trees. 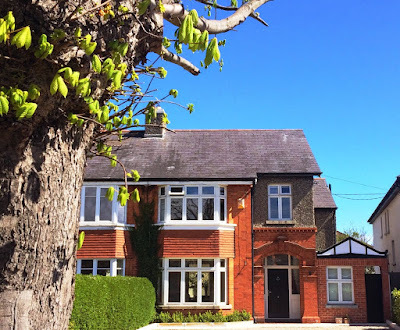 Every time I pass a house on Rathfarnham Road where I spent part of my childhood, I still gaze on the chestnut tree that still stands in the front garden and that continues to shed its chestnuts in Autumn on the footpath outside. Other trees than linger in my mind’s eye include a large gnarled tree in the grounds of the Hedgehog Vintage Inn in Lichfield, the old maple tree in front of the Graduate Memorial Building in Trinity College Dublin that was felled in a high wind earlier this year and the chestnut trees on the drive leading up to Comberford Hall, between Lichfield and Tamworth. Indeed, for years, a collection of chestnuts from Comberford lined one of the window ledges in my study in the Church of Ireland Theological Institute. 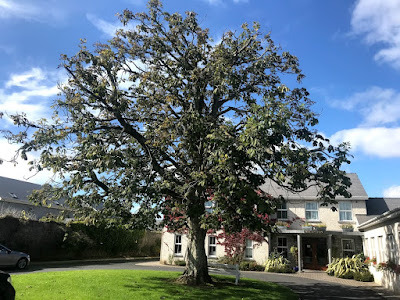 I suppose it was memories like this that were brought to mind as I went in and out of the Rathkeale House Hotel yesterday [24 September 2018], where I delighted in the sight of the large, spreading chestnut tree as I found a welcome working space over endless cups of coffee in the afternoon between one meeting and another. The chestnut tree in the grounds of the hotel is such a part of Rathkeale’s identity that it gives its name to the Chestnut Tree Bar in the hotel. Glenn Miller recorded Underneath the Chestnut Tree in 1939. Nat King Cole first recorded ‘The Christmas Song’ in 1946, with its opening line, ‘Chestnuts Roasting on an Open Fire.’ What has become a popular and classic Christmas song was written by Bob Wells and Mel Tormé, during a blistering hot summer in 1945. It is still too early to be thinking of Christmas. But I did not taste roasted chestnuts until I was an adult, although I imagine few men of my age did not grew up playing ‘conkers’ in their childhood. ’Neath the spreading chestnut tree. A version of the traditional song later appears in an episode of Dad’s Army in 1972. The name chestnut is derived from an earlier English ‘chesten nut,’ which descends from the Old French word chastain (Modern French, châtaigne). The name may be derived the Greek town of Kastania in Thessaly, although it is possible that the town took its name from the trees growing around it. Some say the tree takes its name from Sardis, the capital of Lydia in Asia Minor. In Shakespeare’s Macbeth, one of the three Witches or Wayward Sisters threatens to kill a woman’s husband over a chestnut. This is meant to show the impassivity and comic relief of their characters. Around the same time, the name of the chestnut is used twice by the translators of the King James Version of the Bible. In the first instance, Jacob puts peeled twigs in the water troughs to promote healthy offspring of his livestock: ‘Jacob took him rods of green poplar, and of the hazel and chestnut tree; and pilled white streaks in them, and made the white appear which was in the rods’ (Genesis 30: 37). In the second instance, we are told ‘The cedars in the garden of God could not hide him: ‘the fir trees were not like his boughs, and the chestnut trees were not like his branches; nor any tree in the garden of God was like unto him in his beauty’ (Ezekiel 31: 8). The first occurrence is now translated as almond in the New Revised Standard Version, and the second as plane trees. But the chestnut’s appearance in Macbeth and the King James Version of the Bible shows that in early 17th century England the fruit of the chestnut tree was regarded as a local staple food. By then, the great Tortworth Chestnut in Gloucestershire was centuries old and a well-known landmark and one of the largest trees in England. For some reason, I imagine we are losing too many of our old trees on these islands. But one of the most ambitious environmental projects of the new millennium was a plan to quietly transform large tracts of Leicestershire, Derbyshire and Staffordshire with a blend of new planting and ancient woodland that in future are going to form the largest new expanse of forest in England for 1,000 years. The 200 square mile National Forest takes in a few large towns and several small villages, intermittently pretty countryside, surviving scraps of the ancient Needwood and Charnwood, and a landscape scarred by mineral extraction and spent coalfields. This land now supports thickening stands of dogwood, sweet chestnut and hazel. eventually, a third of the land area, 13,500 hectares, will be under trees, mainly broad-leaved. Planting continues apace, and in centuries to come there may even be an unbroken canopy from Leicester to Lichfield.